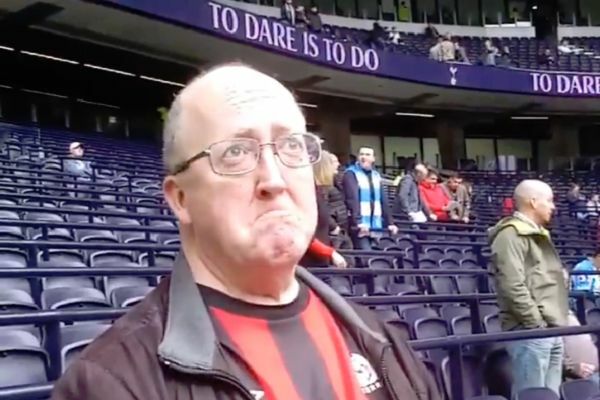 A Huddersfield supporter took it upon himself to recreate an emotional moment for one Tottenham fan upon entering the club’s new stadium in north London. Spurs beat their already-relegated visitors 4-0 at the recently-constructed ‘Tottenham Hotspur Stadium’ in the early kick-off on Saturday. Upon returning to their local area following a not-so-brief stint at Wembley, some season ticket holders were overcome. A video of one man in particular reacting to the sight was widely shared across social media. Ahead of the Premier League clash between the two sides at the ground this weekend, a Huddersfield Town fan reenacted the clip as he stood facing the newly-laid pitch. He uploaded the video to his Twitter account alongside a copy of the original.